This weekend my girl and four friends spanning the ages of six and seven worked together to raise over $260.00 to send to Haiti. My heart is bursting with delight and pride in seeing these young girls work together as a team to make a difference for someone else on their own inspiration. A week or so ago, my girl and I were talking a bit about ways we could reach out to Haiti. I'd made a donation to Mercy Corps but I wanted to do more and work together with my girl in the effort. A few days later, we went to pick up a friend of hers for a play-date. As it turned out, her pal "E" was in the process of making Lavender Sachets to sell to raise money for Haiti. E's mama is a good friend and thanks to her mom had the goods to make a lot more sachets. The next thing I knew, we were back at our home and these two girls made nearly thirty sachets to sell. By Saturday, the girls and more of their pals set up shop in the breezeway of one of our local Organic Markets thanks to the generosity and support of the Market's owner. In two hours, the girls raised $130.00 selling their lovely Lavender Sachets, cookies, art , fortune paper-folds and beaded necklaces. Us Mamas cleared the way and let the girls do their work. They greeted every customer and cheered to each and every donation. Feeling the thrill of their work Saturday, the girls wanted to go back and try and raise more money Sunday morning. The market runs a 25% off sale on all produce so we figured traffic would be even better. Two more hours and $130 more dollars for Haiti. The girls were thrilled. Vision. Action. Teamwork. Making a Difference for another. We can make wonderful things happen in small and powerful ways. Yes! Thank you, thank you to all who have been contributing, knitting and spreading the word about our project. Hats and scarves have been coming in, in fact, there's a box full in my living room right now with more on the way. The November 1 deadline has past and as noted before we're super flexible about any deadline. We'll keep on donating throughout the fall and winter as we receive your generous donations. You can read more about the project here in case this is your first peek. And thank you for spreading the warmth. The wind is howling something fierce letting us know that a Northeaster (or 'wester) has come to town. The winds are blowing around 25mph with gusts upwards of 50mph. And its raining. A day and night that gives Autumn its name. Someone I know said she thinks she may have seen that ole witch flying across the sky tonight. Leaves swirl and whirl upwards in the wind all to fall and be raked again. We dress for warmth in sweaters and coats to keep from chill. We are grateful to be cozy and warm and enjoying the sounds from a comfortable place. I took a break from my work at home today to to get out in the wind and accompany a dear friend to Goodwill where we picked out a small slew of childrens clothing to send to a village in rural Honduras. And I realized once again, that there's nothing like doing something for someone else to get you out of your own head-space of swirling thoughts. As we went to pay for our purchases. My friend mentioned to the cashier, she was sending the clothes to children in Honduras. I love how a few simple words can open a beautiful dialog within someone you've never met. This woman shined, radiated light. Perhaps that sounds dramatic but it was true. When she heard J mention Honduras, she told us she was from El Salvador and knew first-hand how much the kids would appreciate the clothing. Like these children in Honduras, she grew up very poor. She said she was lucky to have had an "American mother" who was sponsor through a church that would send her clothes and supplies as she could. She lived through a war, lost a brother to the war. She slept in fear of being attacked in her home. She told us she had her first pair of shoes when she was 10 years old. She told us how she came with her sister to the United States fourteen years ago separate from her parents who came first. Her gratitude emanated as she talked about how much she loved living here now in the United States, in this town. She is so happy now, she said, to have her family here altogether. Now, she is a mother to three. After hearing her story in the time we both paid, I felt profoundly moved from the spot where I'd been before walking through Goodwill's doors. Here was someone who had endured an unimaginable amount of suffering beaming gratitude loud and clear. For many of us, I think it so important to be reminded of everything we have. I know I need to be. I suggested that she go talk to kids in schools and share her story. She said she's been doing that at her church but would love to get out in the schools. I can imagine service learning projects blossoming from her talks where schools and families work to raise donations for supplies for health in families and schools. I felt moved to do something this day beyond my own little world and set of issues that can feel inconsequential. When my girl got off the school bus today with her friend, I mentioned how I'd been on the outing with J to gather clothes for children in Honduras. The three of us came back home and the girls drew pictures to send to the kids along with the clothes. We were soon joined by another friend and her girl and who got right into action and made a piece of art to share too. Now the girls want to send markers for the kids and other supplies. There's more to do as we all know. I feel myself wanting to jump in in all directions. There are many people who need help locally, nationally and then of course in so many other places beyond our borders. Keeping people warm this winter, feeding those who are hungry. Helping to keep families safe and in a solid home. I am reminded today that service is something I want to infuse as regular part of my family's goals each year. My girl's dad wants to plant trees to work towards environmental health. I want to send clothes and dental supplies to children in need and help spread the word in the ways I can. I want to grow our Warmth project even bigger. Last year, my girl gave books to kids living in a shelter nearby. We'll keep on doing that. We having something to give that is tangible and not, so we take a step outside of ourselves. Outside of our box. Please take a look at Project School Supplies. This project was initiated by one woman who retired from her work in the States and traveled to Honduras to learn Spanish. Within a few months, she sold everything she'd had in the states and moved to Honduras. She founded Project School Supplies first to help gather supplies for village schools in rural Honduras. Now, the project has grown from helping to build, repair and supply schools to also raise money and supplies for health and dental care. Clearly, the story of Ellen's initiative is more remarkable and more expansive than I can begin to detail here. Project School Supplies started with one woman moved to do something. I don't know Ellen but from reading her story, I am inspired to keep moving. She followed an inspiration. Took countless risks perhaps. To me, her work is evidence of putting a dream into action. There are many ways to help with Project School Supplies. I appreciate your having a look to learn more. This year, we are geared to build our Warmth project even bigger in order to help more people faced with the critical challenge of keeping warm. Last year, we received some wonderful donations in the way of hand-knit and crocheted hats, scarves and mittens. We donated the items to the Interfaith Coalition here in town who runs an Emergency Shelter as well as provides clothing to the homeless. Well, Mercury is on his way back apparently from where he came. Travelling for a couple more weeks. Heading back from his month-long stay in retrograde I'm figuring. Whether it Mercury on the go again or the fact that I had a really wonderful talk with my now six year old girl, my mama cosmic system feels more aligned than the week past. I am thankful for having the mind space to stop and check in with my girl and celebrate her growing in a sweet way just she and I, connecting through conversation. Thankful too for time in my garden. Hands in the soil always nourishing. Quiet meditation while digging. Grounding. We capped off my gir's birthday week with her friends party this last Saturday. Usually, we've had her parties at home which has always been a lot of fun but this year we headed to one of our great local parks and celebrated there. There's a playground at this park so for nearly two hours kids were moving, running, jumping, swinging with time outs for snacks and stories. My dear friend who is like an Auntie to my girl treated the kids to a story while they snacked. We made an art table in the picnic shelter so kids could draw, color, paint. And I'd packed some face paints and thanks to a dear friend of mine, every one of these sweet children who wanted their face painted left shining with a lovely design of their choice. This Mama likes to keep things simple when it comes to birthday parties. And that said, as simple as I always aim there's much to do to prepare. All fun though. the baking, snack planning and set up. We made gift bags from lunch bags and tried to keep them useful and fun. We nixed baloons and instead gave everyone a flower. We opted for no gifts this year for the second year in a row though this year we tagged on a community giving project. We asked our friends to bring books for a kids book drive. This was my girls idea. I'm all for showering her with gifts and she gets plenty from her Papa and me and her grandparents, aunts, uncles and friends-like-family so we thought why not spread the love way outside of home. We collected a bin full of wonderful books thanks to the kind hearts of our many friends. I'm looking forward to taking our box full of books to one of our local agencies next week with my girl. The rest of the weekend lots of playtime with our dear neighbor friends. The kids jumped on the trampoline and sat in the kiddie pool and face painted themselves way way outside their faces. I so love watching their free spirits fly. On Sunday, we spent our morning into early afternoon at another local park yesterday where the kids biked round and round. My girl and I met our neighbors there and us mamas got to visit while the kids played. This kind of day, my favorite. organic as it unfolds, slow and free-flowing. Easy. We played in the garden and added new starts to our raised bed vegetable garden, my girl's favorite: edamame and one of mine, cucumber. We are loving all the new blooms in our garden. Loving the new bursts of color and the magic that marks the near start of summer. So farewell dear May 2009. Thank you for another beautiful year watching my girl grow. And thank you for this taste of summer as the sun shines down. On we go, moving foward as we say hello to June. The rain that came to town earlier this week and by yesterday turned to snow. Saying yes to snow in the mountains and yes to the possibility of skiing and yes for all the gratitude that we feel for having our home, and warmth and each other and yes to the generosity of all of those who knit and crocheted and donated warm woolens to our "Warmth for Washington" project. My girl and I dropped off the beautiful bounty of crocheted hats from Mia at Homespun Helpers. We took the big box of hats to the Interfaith Coalition just in time it seemed for the latest cold snap. I stopped by their offices again today to drop off another small stash of hand-knit woolens and the staff person told me the beautiful crocheted hats made by Mia had already been distributed to people on the streets. I'm excited to keep growing the "Warmth" project to be even bigger next year. Thank you again to all who have generously donated their time and hand crafted goodness. I'd posted a couple of pieces about an local young boy named Kyle Roger who has been fighting with incredible power, courage and positive force an inoperable brain stem tumor called DIPG(Diffuse Intrinsic Pontine Glioma). Kyle passed away peacefully this past Saturday morning February 7, 2009 surrounded by his incredible loving family. Kyle and his beautiful family have literally opened their hearts to share their journey. Kyle's mom Christin has kept a diary she shares documenting her journey. I cry nearly every time I read it yes because of the heartbreak but more because she as a mother is so inspiring in her courage and grace. She shares their moments finding joy through the pain. Never ever giving up. Truly, words cannot express how this family has touched my heart and so many others in this community and beyond. I have said before, I don't know the Roger-Wilhite families personally but have dear friends who do. None of that matters. Their hearts are open so wide and because of that so many lives have been touched, forever changed. Kyle's mom Christin, father Jocelyn and brother Nicholas and all of his family true warriors. Marching forward with beautiful optimism. Living life in pure love. They lived each day, each moment to the absolute fullest. Those who I know who knew Kyle well say he was one of the most amazing children they've ever known. So briliant in heart, in his mind, in his joy and zest for life, in his phyiscal and mental abilities. Brilliant. I know Kyle's light will continue to shine way beyond this earth. He has the power already to have touched so many lives. A shining example of making the most out of our lives. Pushing beyond. Living determined and purposeful. There is a beautiful piece that was posted on Kyle's blog the day he passed called "Dragonfiles and Waterbugs". The image of his beautiful soul soaring onward is so lovely. There are hundreds of comments of condolence and tribute and gratitude to Kyle and his family. Evidence of community moved. The power of what happens when hearts are opened wide. I find myself so pulled to want to do something anything. To honor Kyle, the family has provided information, on his blog, ways to help Kyle's doctor, Dr. Jim Olson continue his tireless research in finding ways to fight this horrific disease. There is also a beautiful peice on Kyle in the Seattle P.I. written by Greg Johns who had followed Kyle's story early on in his diagnosis. To Kyle, thank you for sharing your journey for inspiring me to keep reaching deeper. To find the moments in our days and to squeeze my girl that much more each day. Soar high. Soar free. Boundless. Limitless. And to his family, I am sorry this beautiful life of Kyle's was cut so short here on earth. You have given us all a gift in opening your hearts, sharing your journey. You are amazing each one of you in your courage, strength, determination and positive light. Truly awe-inspiring. Kyle was so loved, that is clear. That love he carries with him as he soars now high and free. And may his light fill your hearts and bring you peace. I'm finshing a poem that I was inspired to write from all I've learned through Kyle and his family. Once I send it to them, I'll post a copy here. No pictures for this post but I sure hope to have some after the weekend as we're heading North for a weekend in Whistler, B.C with our good friends and neighbors. We're looking forward to some more time in the snow for a little ski, sled or just playing around. On another note, my most heartfelt prayers and intentions of light and positive energy go out to the Roger Family. I've mentioned a little of the story of Kyle (who turns 8 tomorrow! Happy Birthday Kyle!). Kyle was diagnosed nearly two years ago with a rare and inoperable brain tumor called DIPG. Unfortunately, Kyle's situation has deteriorated a bit more in the last week. Remarkable and beautiful though are their love and determination. Kyle and his family's unwavering determination, courage and strength are inspirational. They are surrounded by so much support and love it sure seems. There's a link to one of their blogs on the left so that you can learn more. There are efforts to raise funds for research for this horrific type of tumor and ways to help alleviate some of the medical costs this family has endured. There is clearly so much love and support, prayer and light spread their way. Though I know I don't know this wonderful family personally, I have several friends who do, and our town is a small one. Undoubtedly, they have made their way into my heart and the hearts and minds of many others. I think of each one of the Roger Family every day and send each of them thoughts of healing and rays of love and light. Be well and happy weekend. My friend who I've worked on this project with just delivered the stash of warm woolens we'd gathered so far to the Interfaith Coalition here in our town. We had a box of hats and scarves all hand-made to give. The coalition opened, just this last weekend, a Severe Weather shelter set up specifically to "provide a warm and safe place for individuals who would otherwise be on the streets." The Coalition was so grateful to receive what we'd gathered from the "Warmth for Washington" project. We are so grateful for what we could share as these handmades provide the essential need of warmth for homeless children, women and men. Thank you to all of you who posted links about "Warmth for Washington" and to all of you who could contribute. We welcome always your handmade donations as we plan to keep distributing throughout the year and will grow this project even more next year. I also want to introduce you to a blog about an amazing young boy and his family here in our town. His name is Kyle Roger. 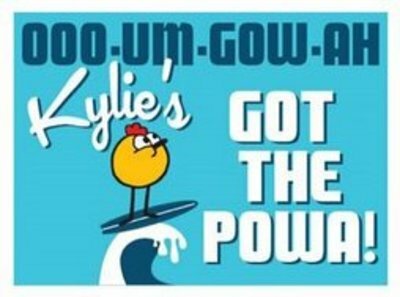 KyIe was diagnosed in February 2007 with a rare, inoperable brain tumor called DIPG(a Diffuse Intrinsic Pontine Glioma). Though I do not know Kyle or his family personally, I know many people who do and I have been following Kyle's story since I learned about him and his family in the Spring of 2007. Please visit this blog to learn more about this amazing young boy and his wonderful family. Kyle's mother Christin also has a blog documenting her perspective that is beautiful and heartbreaking and uplifting and inspiring. And there's a really cool project going on now for Kyle and his brother Nicholas. People are taking a few extra minutes to send holiday cards to this wonderful family this season(corporate, personal, hand-made cards are all welcome.) They boys according to their Mom's post are just excited to go to the mailbox each day and read all the wonderful cards showing support. Please email me for information on how to send a card to Kyle and his family. Thank you again for your help with "Warmth for Washington" and if you have time please visit Kyle's blog and perhaps send him a card to show your support or find out other ways to help through his blog. On this rainy Northwest day, my girl and I hunkered down in the kitchen and made a two loaves of a lovely white french style bread. We read books while the bread was rising and listened to music together. The Papa had to work late tonight so it was girls night around here. 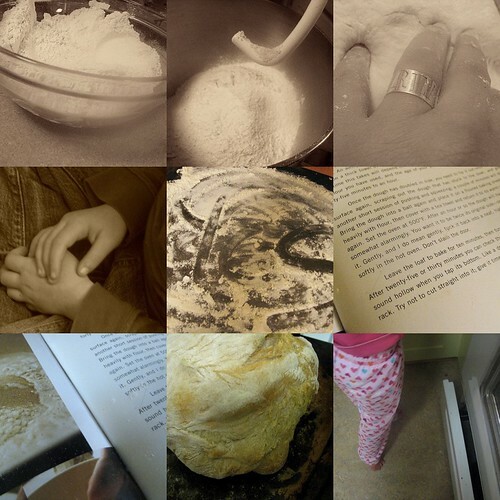 All day I thought about making bread of kneading and working the dough with our hands. I have felt inspired and incredibly awake inside in thinking about this marvelous time we are living in, that we are being in. Being in. Yes. Actively. Yes there is much to do on the arduous path ahead but we will continue to trek, together. For me, my family, my community near and far, I feel inspired to keep working and giving in ways perhaps I cannot even imagine yet. I know deeply we will continue to raise our voices and dig in. With our hands, hearts and minds, we will be of service. With compassion, we will work together. We will ask what can we do. As we made this bread together tonight, I thought about all that we want to continue to teach our girl about digging in and giving back to our community, our country our world, about speaking out for what she believes in, in a way true for her does matter, her voice can affect change and that she is capable of achieving with hard work what she may dream. I thought about how she will understand one day the magnitude of the tides that are changing and how blessed we are to be raising our girl in this momentous time. I am deeply grateful we are living in this time and that this day has come when hope persevered and won. I am grateful we can see together barriers beginning in big ways to fall. As my dear friend and I were smiling widely chatting across the internet with each other today sharing our pledges of hope and commitments of putting our compassion into action, she shared this with me. We have leapt together perhaps toward our new collective self. And we will continue to make tremendous leaps by working together in this new day. Amazing. As we finished our stories for the night and turned our her light and said goodnight, my girl said "Mama, I'm so glad to have this night with you"...yes my sweet I am so glad too.